The plan was to do my 4th Fasting Mimicking Diet from July 3 to July 8 and then donate blood on July 9th. Let me unpack that sentence. A Fasting Mimicking Diet is a 5-day very low protein diet created by Dr. Valter Longo. It has longevity benefits. The reason I wanted to donate blood just after the 5-day fast was that I knew that due to being in a low-calorie mode for 5-days that many of the toxins liberated from fat cells would be in the bloodstream. Donating that pint is just another detox pathway. That was the plan. But I made an error that may not apply to you. In order to donate blood, you need to meet a certain iron level. That level will likely vary from region to region. In Seattle, they increased the requirements in 2017. Since then, I have been turned away a few times for just missing the lower boundary of iron of what they accept. I want to pause here and explain this to the idiots that interpret me being turned away as proof that my diet leads to iron deficiency. My iron levels are in the healthy range. In fact, I’d go further and say they are probably optimal. The blood bank changed their policy to protect the health of the donor. They were concerned that after donating, the donor’s iron level would drop too much for the weeks post-donation. Anyway, I learned online how fasting can lower iron levels. Since I was already on the lower boundary, I knew if I fasted before donating that I’d likely be turned away. So, I donated on July 9th and started my fast on July 18th. I got my 4-gallon pin for Washington in 2017. 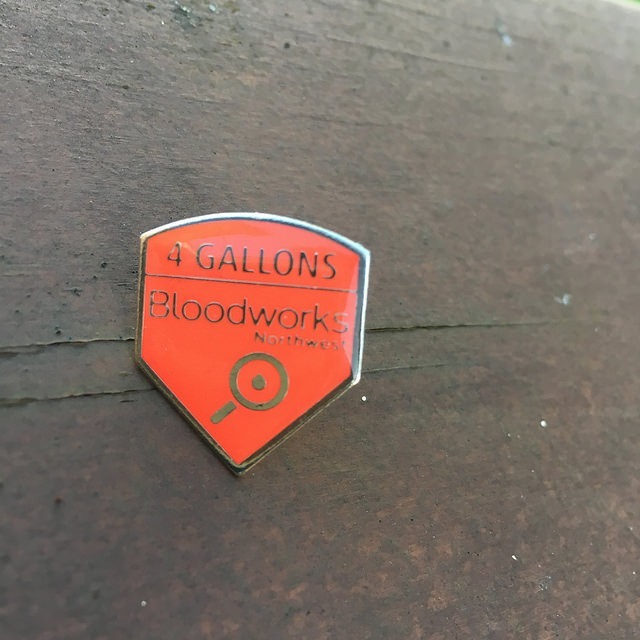 I expect to get my 5-gallon pin in 2019. In March, I put together this post The Potato Diet Version of the Fasting Mimicking Diet. The short version is that I felt Dr. Longo did not convincingly explain why one would need to restrict healthy carbohydrates during the 5-day fast provided that protein was kept very low. So, I constructed a potato diet version. In a follow-up interview on Found My Fitness, they talked about a relationship between insulin and IGF-1. It was beyond my understanding, but the lesson I took away was that potatoes might interfere with the benefits of an FMD by affecting IGF-1. I still suspect that just getting the protein super low is the secret sauce, but if I am going to go through the effort of such a strict diet for 5-days, I can at least play by the rules. Even if I don’t understand them fully. My initial plan for this fast was to go 5 days with zero calories. The reason was I figured there are benefits of applying different fasting strategies and that following the most strict version of zero calories would make the most sense in the summer. The reason is your body temperature drops. Being in a warm season would make it easier. As day 3 was winding down, I started to feel colder and colder. It was sunny and 73 F in Seattle and yet my hands and feet were ice cold. By 6 PM, my right hand was turning yellow. I knew I had to end the fast, as I did not adequately prepare for feeling cold. So I went to the store to get cabbage and avocados. About an hour or two after eating a few avocados and a plate of steamed cabbage, I had to run to the bathroom. A quick search on a fasting forum taught me that eating a high-fat high-fiber meal after going 3 days without food was an error. Before I do my 5th FMD, I will revisit the food choices in the Fasting Mimicking Diet book. About 10 am on Day 4, I called it quits on this fast. I was cold and felt awful. As for hunger, it wasn’t bad at all. A little on the evening of Day 1 and the morning of Day 2, but not bad after that. Even though I didn’t get the full 5-days, I still feel this fast was successful, because I learned a few important lessons. The two big ones are to solve for heat regardless of the season and to not eat fat bombs after days of no calories. I started the fast at 194 pounds. After a full day of refeeding, I am at 188. I expect to settle in at 191 or 192 by the end of the week. Only one episode from the TV show House has stuck with me, the one where the patient was being poisoned by toxins liberated from their own fat after weight loss. If your health is in such a dire place that you need a blood transfusion from a stranger, any issue of an increase in environmental toxins is trivial to surviving at that moment. The blood bank screens all their donations for any marker they deem important. “Have you been fasting or dieting?” is not a question they ask. You also need to consider that if I don’t donate that pint, then that pint stays with me and I’m super healthy. Not just by my standards, but the standards of the blood bank. I see my donation as a win-win. My health improves and so does that of my donor. And in my case, whoever gets my blood is getting youthful blood, since I’ve donated regularly for almost a decade. Although I keep learning about fasting, nutrition knowledge, and other health-related information, I often change my mind about what I have learned. ***After 8 years of a Paleo-type diet which was beef-heavy; then I slowly transitioned to my current mostly-pescatarian diet due to Longo. Also after donating blood about 3 times a year for 10 years (to possibly improve health/longevity), I had a blood test last December and found my iron and hemoglobin to be a little low; so I will not donate blood again until I have another blood test. ***In the last 7 months I have completed 4 Fasting Mimicking Diet sessions in which I ate about 800 calories daily consisting mainly of potatoes, onions, mushrooms, sweet potatoes, olive oil, and avocados; I will probably continue to eat complex-carb foods in my next FMD. ***I and many other people who fast have noticed feeling great at times on some fasting days and feeling poorly at other times; my theory is that when you don’t feel good, toxins are being released which overwhelm one’s detoxing ability; some toxins (like some allergens) might overwhelm us even when in tiny quantities. When fasting, I expect to have lower energy for physical activity, and I hope that I don’t have much time in which feel terrible from overwhelming detoxing, but I will try to persevere if I feel terrible. @Mark L. – I’d be interested to know if your iron levels were really lower or if your blood bank also increased their requirements. In Seattle, I believe the higher guidelines went into effect in late 2016. @MAS – My blood bank did not reject me because of my iron level; they will accept my blood, but I am not going to donate blood again until the blood test from my doctor is in the normal range. My hemoblobin was just a little low at 13.1 according to the reference range of 13.2 – 18; my MCH (Mean Corpuscular Hemoglobin) was 26 which also was highlighted as being low. ***When I called my blood bank today, I was told the lowest acceptable iron level for males is 13 and 12.5 for females. (This is an increase from what they used to require.) I don’t understand a lot about the blood. Now, I am reminded how low levels of Iron can result in feeling cold, which is what happened to me this month. I donated. Then had to abort a 5-day fast, because I was too cold. Possibly connected. @MAS, just like @seantheaussie, I don’t get the logic you use to defend your blood donation. If you are so concerned about the detrimental affects of the toxins in your blood when you are a self-described “super healthy” person, how can you be so certain these same environmental toxins would be “trivial” to someone already so ill that they need a blood transfusion? All I can see here is two possibilities: Either those toxins are negligible to begin with and your own liver will deal with them – in which case you’re have nothing to fear and no need to resort to bloodletting, especially as you don’t have excessively high iron – or they are harmful, in which case they’d harm a sick person more than they would you. You can’t have it both ways. It sure would be nice if there was an expert here who could settle this with some medical jargon. Until then, it looks like an ethical question and you don’t come out looking too great. @Christine – This idea is not mine. Tim Ferriss and Dr. Eades have talked about this for years. Sure I’d love to hear the feedback from a blood expert as well. It is my belief that we are both better off. But I will concede to an expert. I received MAS’ response to Christine’s question almost 5 hours before I received Christine’s question. Oh well, at least it got through live mail’s spam filter for once. For clarification, I assume you’re discussing hemoglobin levels in these posts (the thing they test after the prick when you arrive to donate)? Have you ever had your ferritin levels tested? My 23andMe test came back saying I was at elevated risk for hemochromatosis, and after a doc visit and some tests, a fairly mild case of it was diagnosed. My ferritin level was 650 (37 year old male for reference). The numbers are inexact but 50-150 may be optimal; 300-500 is high normal; and around 1,000 they start screening for internal organ damage. Once you start reading stuff about hemochromatosis online you find out there are people who run up their ferritin numbers into the several thousand range, hence my view that I have a mild case. I’ve since been donating every two months to bring it down and its going quite well. That said, I’ve always had a bit more than my share of muscle pain and weight issues, so I’m curious to see how getting my iron level down will affect (or not affect) these things. I’d imagine you’re ferritin number is pretty low after all the donations, but would curious to know what it is. Might be an interesting second point of reference for your overall iron status. @tml_mpls – The 39.0 number I quoted is HCT (Hematocrit), which is the marker they use in Seattle. I have not had my iron level tested directly. People who need blood transfusions are generally in a bad state and close to death. As MAS notes, the consequences of not getting a donation then are far worse than the potentially adverse impact of “toxins” thrown off by fat cells that have undergone 5 days of FMD. As MAS notes, blood donation organizations screen for health concerns that worry them – and the list is deep. Fasting isn’t on the list. You are also assuming, falsely, I’d argue, that the donee’s endogenous blood is less “toxic” than MAS’s. MAS is very healthy. His “toxic” blood is probably “cleaner” than the donee who’s life he is saving. So a donation from MAS in his fasted State could well be a net positive, even for a liver transplant recipient. A pint of blood is about 10% of normal human blood volume. Assuming the donee (and all other donors) are totally “clean” (unlikely) the net increase from a contribution of blood from a fasting donor is low. Donate blood. It saves lives. @Geoff – Thanks. That is what I suspected. Interesting! I need to get started donating blood. I have done a bit of reading, and think for most people, one of the issues of the “modern” diet and the problems it causes is the fortified foods and high iron levels. Iron feeds cancer, pathogens, causes some other issues. Low iron can be an issue for a small number of people, but usually only women, and to high a level can cause just as many issues. http://roguehealthandfitness.com/category/iron/ This guy does some good articles on iron, and though I no longer really agree with his Ketogenic diet ideas, I think he may be correct in some of his assessments on iron.